Yes, this came from a place mat. Pretty stinking cute if I say so myself...and yes I a referring to the little man and the little man's tie. I found these old place mats and my brain immediately said "TIE". I have been wanting to pound out a pattern for a little man's tie for, well forever. Finally I sat down and worked one out. Hopefully this how-to is easy to follow. The patterns are in this post. It is for 12-24 months. The pattern is NOT perfect or pretty, but hopefully there is no judging in blog land and you guys will still love me. This is only part 1. Part 2 will come tomorrow. I realized that this post would have been astronomically large if I posted it all. So in this post I will show you how to sew the tie itself and the neck band. 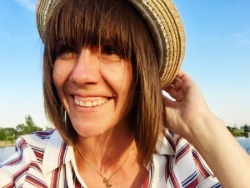 Tomorrow I will show you how to attach the tie part to the neck band, which is a little trickier than you might think. Cut place mats into two pieces, front and back. If they are the same pattern you might need a different fabric scrap for the lining. Cut out pattern (at the end of post). Lay pattern on top of material and cut out. If there is a pattern to the fabric, you might need to line it up between the two pieces. Match angled ends like so. I ironed a 1/2" guide into the top piece (see below). Pin and sew together along ironed guide line. Cut another strip of fabric for neck band. The width is 2 inches. Your length will vary depending on the size of your little man's neck. Measure around very loosely. Then add another 2 inches. Iron your strip in half. Then iron top and bottom of piece in. Iron in each side edge 1/4 inch. Fold strip in half again. Iron. After you have sewn your two pieces of tie together. Fold out and iron (sorry no pic for this). Don't worry if the edges by the angled seam don't match perfectly. You will fix that later. Once the tie is laying out lengthwise, fold tie in half and iron so that you have a guide crease in the middle. Unfold. Fold tip of each end into the middle and then iron. Fold in edges of each end piece and iron. Take lining pieces, that have been cut out of coordinating fabric (in my case the back of the place mat). Fold in half and iron for guide crease down the middle. Fold up tip, like you did with the other part of the tie, and iron. Fold in edges, like you did previously, and iron. 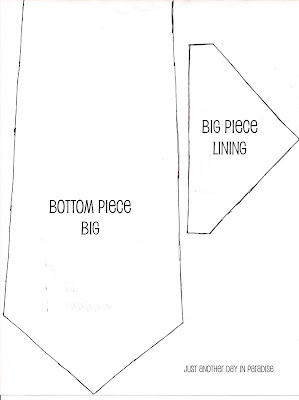 Attach wrong sides of the tie and the lining, so that the lining is not showing on the front of your tie. Hand sew the lining to the tie. Hand sewing note: I know there is an art to hand sewing, I however just do what is comfortable for me. I recommend the same. Repeat this for the small end. With both linings attached, fold in the edges and iron (this is where you will fix the imperfections at the angled seam), seen in the bottom edge of the picture. After you have ironed in all the edges. Fold in the edges to meet the middle crease guide, seen on the top edge of the picture. If you are using interfacing...cut out a strip in the shape of your tie only skinnier. 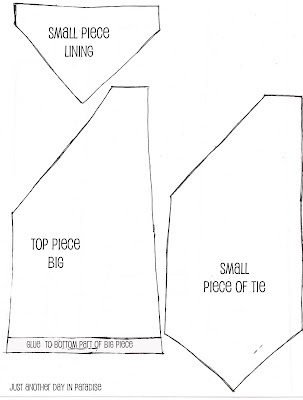 Fit it into the middle of your tie underneath the folded in edges. You will sew it in. Back to hand sewing. I used a ladder stitch here. If you aren't familiar with a ladder stitch I recommend googling it. Sew the entire back of the tie closed. When you are all done, the tie will look like this at the back. That gets us through making the tie part. YAY. I promise it seems like a lot of steps, but once you bust out one, it really is a very easy process. Here are the patterns (remember I know they aren't pretty, but they will do the job...plus they are FREE...YAY). Tomorrow, we will finish up this little how-to and then you will have the perfect little tie for your perfect little man. very cute. Maybe I'll attempt one someday! Thank you so much for your inspiration. I can't wait to make one for my little guy! Have a fabulous day!